The last month has gone very quickly for The Fat Cabbies. We’ve lost over 4 stone so far collectively ( Brian is responsible for 1 of those stones by himself and Cliff isn’t that far behind him!). We’ve now got 5 confirmed sponsors, and a very exciting partnership with Be Military Fit. More about them in a bit. We’ve been on ITV news, BFBS radio, numerous publications as well as interviews with Saul on Cab Chat, Sean on LTR and featured in the trade press. It has moved very quickly for us and Team Fat Cabbies are quickly becoming a well organised and smooth running operation! From that very first tweet I put out a few weeks ago to today, we’ve got to know each other very well and have created a team that is going to achieve our goals. With any great team, there needs to be an equally great team behind us. And this is happening. I have found out very quickly that organisations, companies and individuals want to be involved in something positive in our trade. Raising funds for Taxi Charity has been and will always be key to our project. Frances from Taxi Charity has been involved from day one with Fat Cabbies and has been instrumental. Her ideas will play a key part on how we go forward and how we will fund raise for Taxi Charity. We have the lovely Christina firmly on board. Christina heads Bowden PR and I’m in very close contact with her, almost on a daily basis. Christina is the ultimate professional and looks after our PR, media and marketing. There is no doubt in my mind that she is steering our ship in the right direction as far as PR is concerned and it has been down to her for getting us on ITV, BFBS Radio and there are many opportunities to promote Team Fat Cabbies in the pipeline. The wonderful team of people behind us is growing and they all are as committed and positive about this as we are. Our sponsors to date are UCG, LCDC, Plan Insurance, Taxiapp and Cabvision. We have a long way to go and many more sponsors to find but I am confident this will take care of itself. We are also being supported by Cab Chat, London Taxi Radio and Poppy Cabs. Today (3/10/18) we had an introductory meeting with Be Military Fit (with Bear Grylls). This meeting was fantastic. BMF have decided to support us, train us, advise us on nutrition. Provide medical assessments and prepare us for Kilimanjaro with altitude training. For us, this is invaluable. 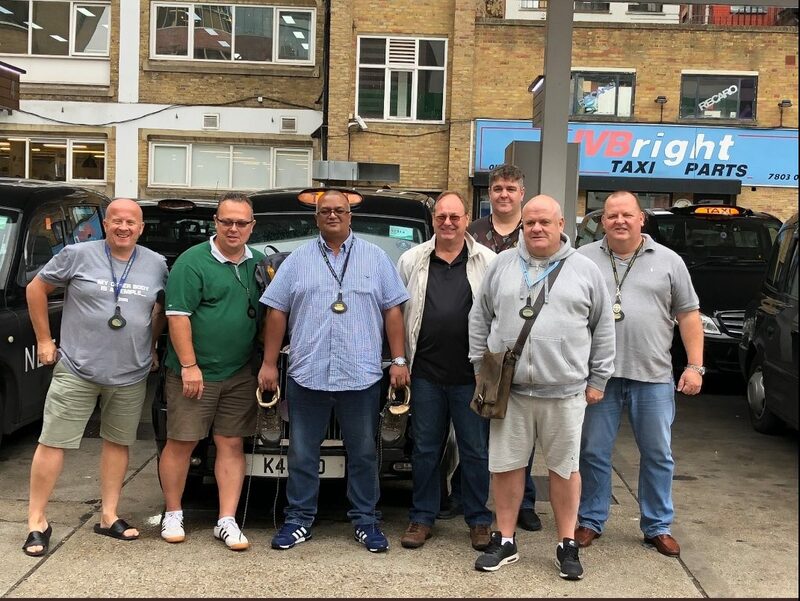 BMF’s role with Fat Cabbies is beyond doubt, the most important aspect to our preparation for our ultimate goal : getting to the summit of Mount Kilimanjaro. They are tailoring our training programme and are assigning a team to us to push us and get us there. To have BMF take us under their wing and brand means this project has reached the next level very quickly and we all can’t wait to get the hard work started. All of us at Team Fat Cabbies came out of that meeting very excited and feeling very positive about the next 12 months. I’ve had a few messages asking why we are 7 fat cabbies now. Let me just clear that up. We originally were 10. Unfortunately, due to personal circumstances, we lost 3. We have had enquiries about others join up but we have got so far in now in terms of organisation and meetings, it probably would be too much for anyone to catch up on everything that has gone on. So we are 7. Myself, Brian, Cliff, Daren, Paul, John and Kevin. Action Challenge, a company that specialises in Kilimanjaro climbs, have met with us and we have decided to take on this challenge with them. They are highly professional and will support us along the way. Not only when it comes to the climb itself, but they will also be instrumental in advising us over the next year about our preparations. So, that’s where we are at the moment. Everything is going to plan and I will endeavour to update you again in due course. In the meantime, please follow our Twitter @cabbiesdokili. Find us on Facebook – search for “CabbiesDoKilimanjaro”. We will be on Instagram soon where you can see many photos of our journey. Please donate to Taxi Charity via our JustGiving link http://www.justgiving.com/CabbiesDoKilimanjaro?utm_id=27 or text the Code CABK99 to 70070 with the amount £1, £5 or £10. Thank you so much. You’ll be hearing a lot from us over the next year!